So I showed you my ordering all these cute clothes for Aria on my Instastories. If you don’t watch those you should because I am a spaz and it’s embarrassing. But, anyway I was able to score some really cute outfits for Aria and I got so much for $83 dollars. I wanted to show you guys not only what we got but how many outfits we are able to get out of all the items we bought from H&M. Everything will be linked at the bottom of the page. 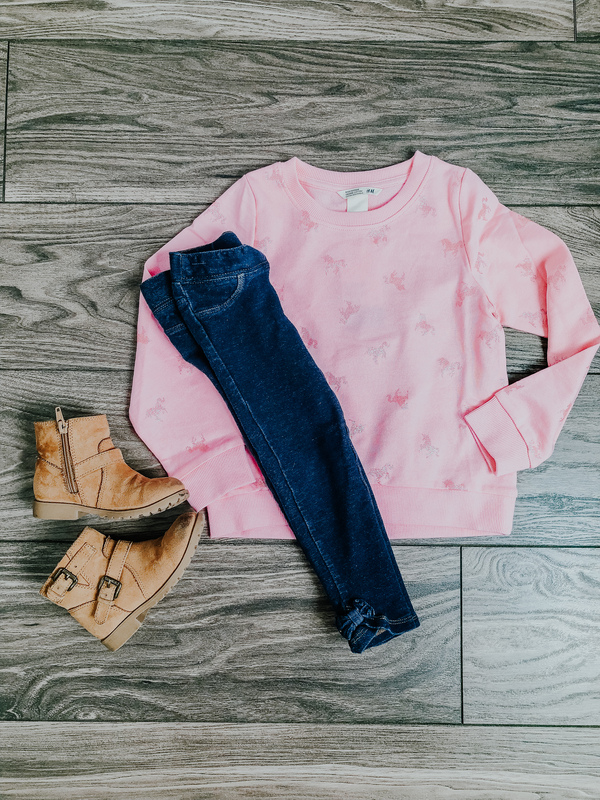 This is such a cute outfit for Spring. 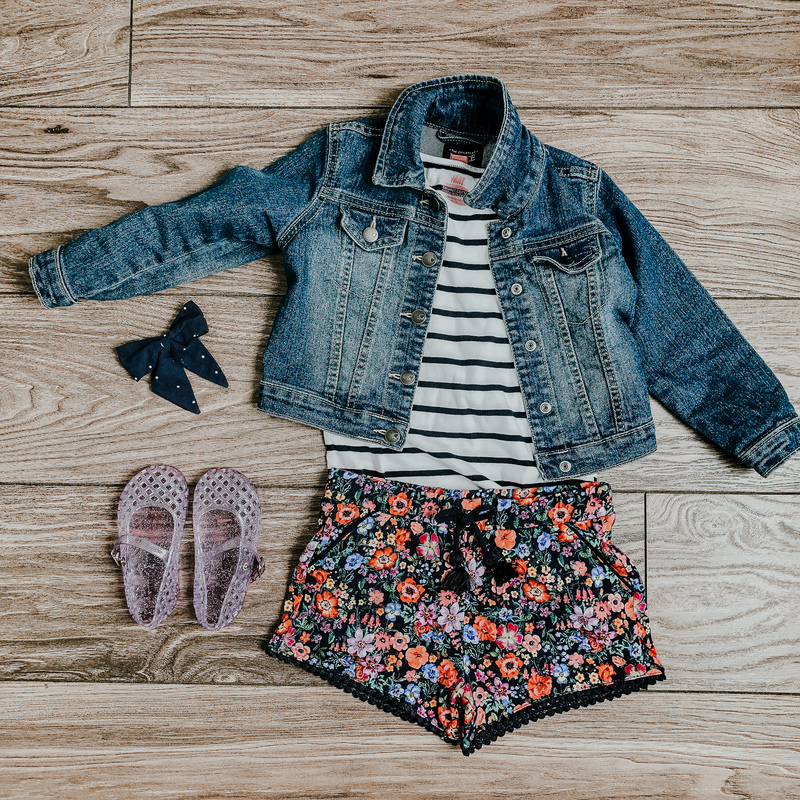 The floral shorts are so soft and so cute on Aria’s cute little tan legs. The pom pom detail is always such a cute touch but I hate that they ALWAYS need to be steamed flat. It drives me nuts when they creep up. I paired this cute yellow lace top with these floral shorts. These shorts can be paired with so many different tops, as you will see. This top looks so stinking cute tucked into these shorts and the sleeves are adorable. 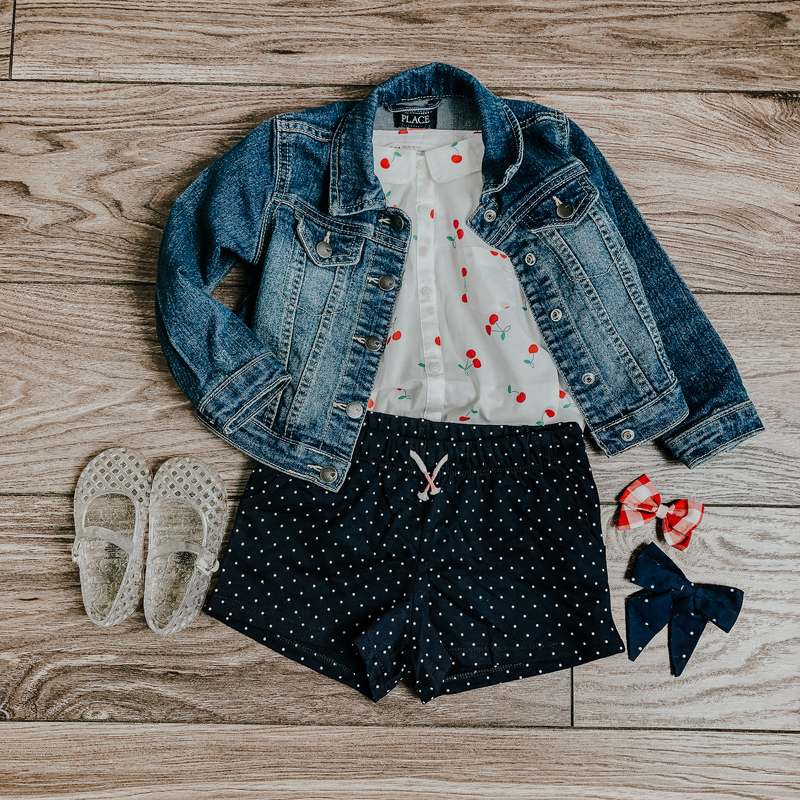 Style this outfit with purple jellies and a cute navy blue polka dot bow. Now we took these same shorts paired it with this cute stripe top. This stripe tee shirt is actually so dang soft! I love love love how stripes look with florals. This is such a cute outfit for spring and summer. Pair this outfit with an adorable pair of gladiator sandals. 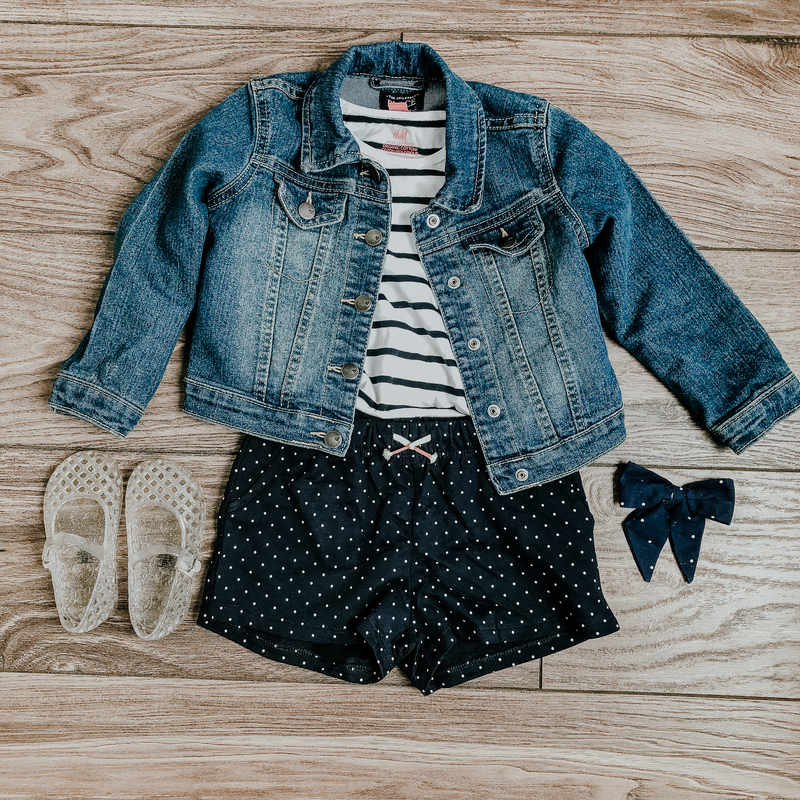 Pair this outfit with a pink bow or a blue bow. So this is the same outfit as the outfit above, but I added a jacket and switched out the shoes. Aria has the coldest little arms so she often wears shorts with a jacket. Her legs are fine, but her little arms just freeze. I highly recommend for every human to have a denim jacket. It is such an essential piece for every closet. So with these inexpensive shorts I have 3+ outfits. This yellow top again is paired with these adorable polka dot shorts. I love yellow and navy together and its such a cute well put together look for your little girl. 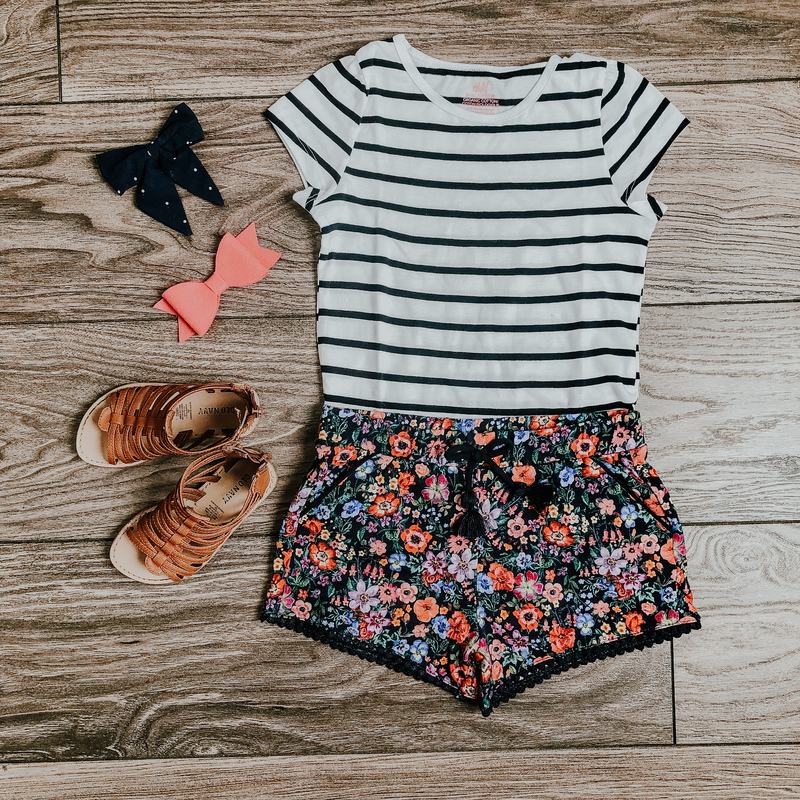 The bow I chose matches these shorts perfectly and the sandals add such a cute touch to this sweet little outfit. I am telling your stripes are a neutral pattern for me. You can pair it with just about everything! So when shopping for Aria I always incorporate a stripe top in her wardrobe. I love how they look with a cute polka dot short and a cute pink bow. Add some cute clear jellies or some gladiator sandals and you are good to go. 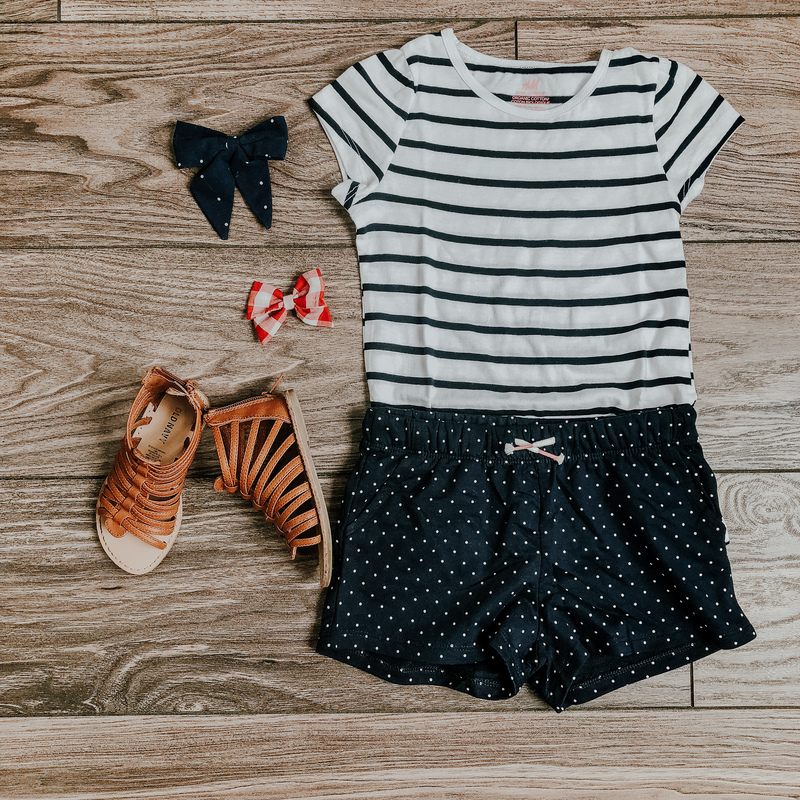 This outfit is also so cute for the fourth of July. So same outfit as above but add a jacket. You literally can do this for every outfit I have styled today. How cute are these outfits though, I wish I could wear all of these myself. I saw this top and I had to get it for Aria. She looks so cute in everything but a cherry top! Are you kidding me!!? 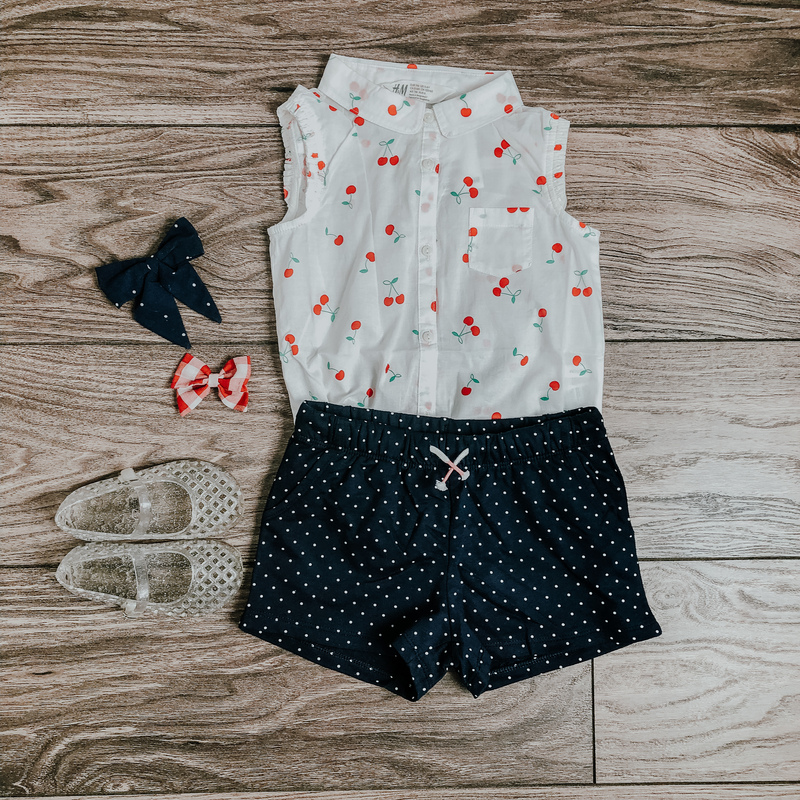 It is too adorable not to style with a dotted short. Again this is cute for spring, summer and the fourth of July, which duh is summer but you know what I mean. I love this outfit with white sneakers, but jellies…are my jam, well Aria’s jam. Aria just watched the Pony movie and is obsessed with unicorns. So while I was shopping she saw this sweater and begged me to get it. Spring in Utah is still cold so I figured she would need a sweater for the cold days. I paired it with a cute pair of leggings that are no longer for sale because Gymboree is GONE. SO SAD!!! For the shoes I went with Aria’s favorite brown booties. Old Navy seriously has the best shoes for kids. I knew Aria would want this one as well. She has no hoodies and we do bon fires often late spring early summer. She needed a cute hoodie for that. So the unicorns sold me. 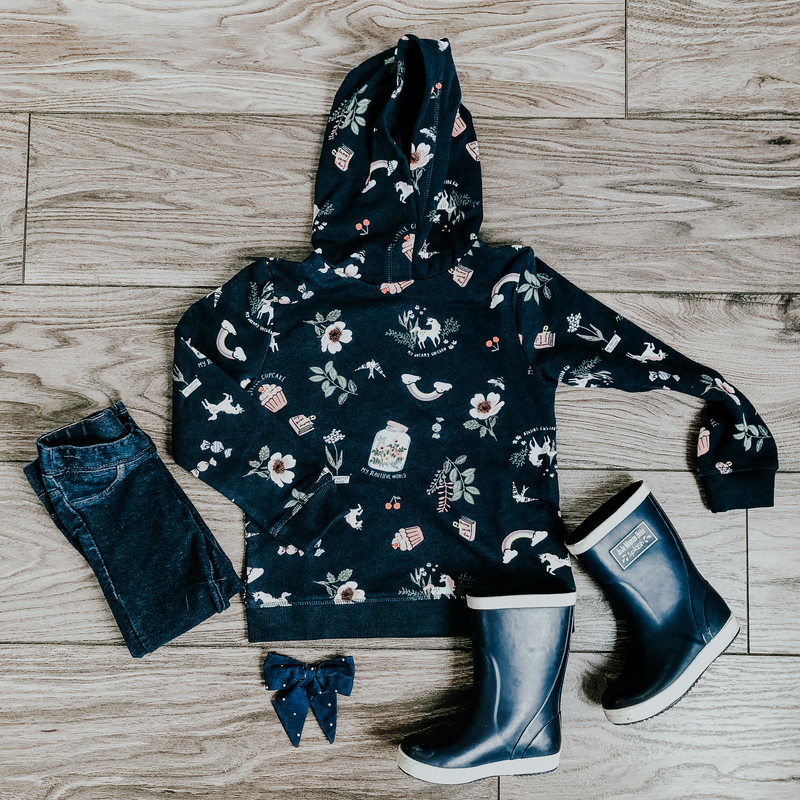 I paired it with these cute jeans and her cute rain boots from Jojo Maman Bebe. I love this outfit on her. I love these floral joggers! Why are they not in my size? Again they pair well with stripes and a denim jacket. I really want this outfit for myself. I saved the best for last because this dress is so stinking adorable. Styling this will be so much fun this spring/summer. 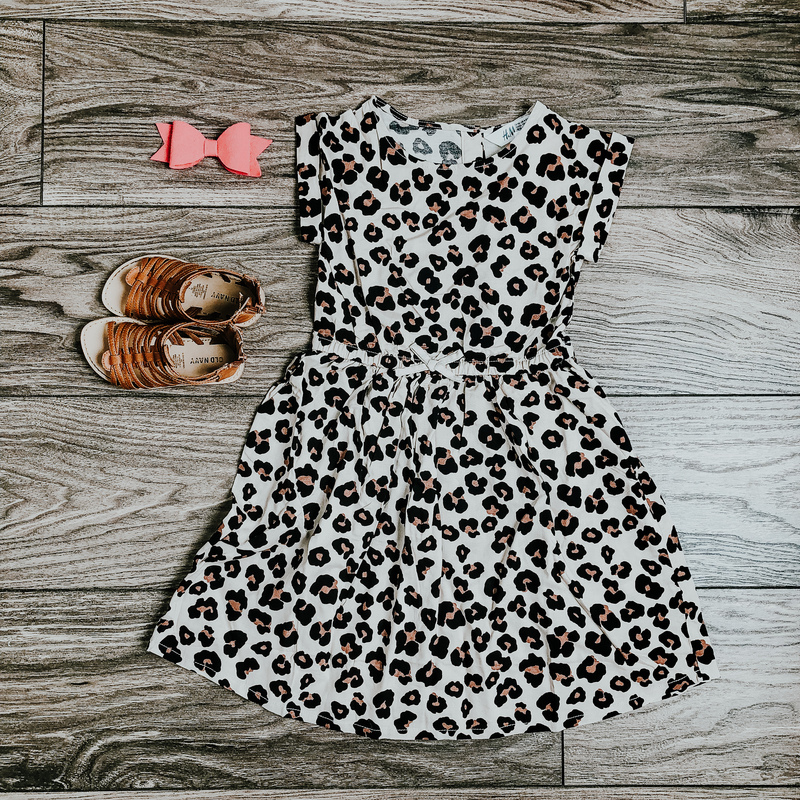 This dress is cute on it’s own and styled with a cute jacket! 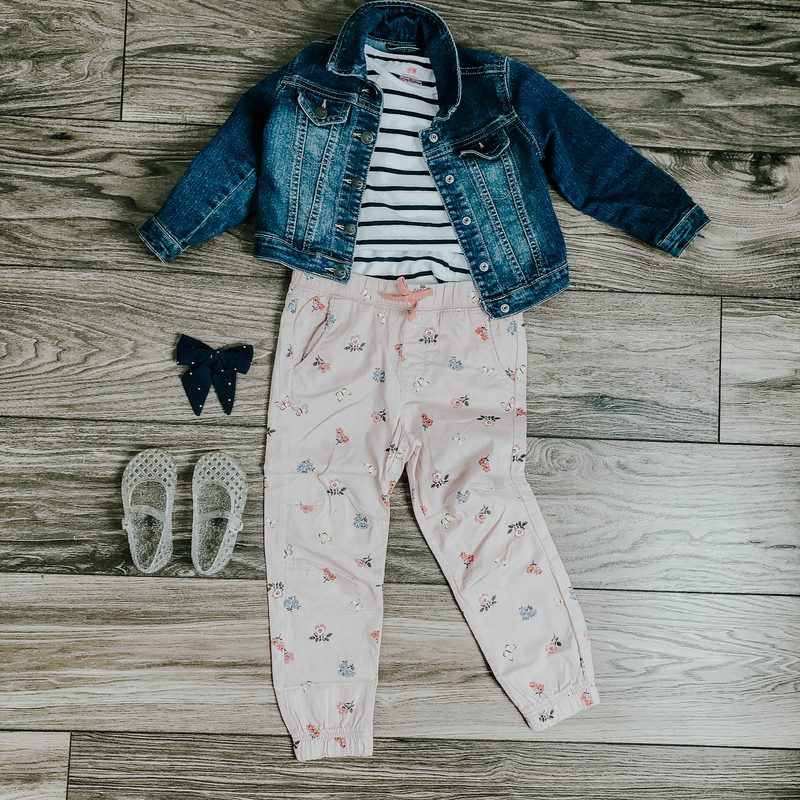 I hope you guys liked these outfits and inspired outfits for your little one. You can find some more kiddo outfits (here), (here), and (here).